Me: Hester and Rosie are girls. They lay eggs. Brontë (slightly concerned): No, Mommy. Hester and Rosie are chickens. Me: They are girl chickens. Brontë (very patiently): Mommy… I? A girl. These? Chickens. Lay eggs. Chickens lay eggs. Not girls. My daughter Brontë has very particular ideas about what it means to be female, possibly because she is the girliest little girl there ever was. She freaks out whenever she isn’t wearing the most glittery princess dress she can get her hands on, and the fluffier, the better. I tried not to automatically surround her with tons of stereotypically feminine things when she was a baby, hoping to let her natural personality emerge instead of defaulting to social expectations. And… so much for that, since her natural personality is apparently made of unicorns, cupcakes, and princesses. We have started gardening recently, as part of my overall strategy of teaching her where her food comes from and helping her build a sense of competence with ongoing projects. I don’t know much about gardening myself, but since she loves strawberries, we decided to start with strawberry plants. She is really getting into our morning routine, striking poses while feeding chickens, collecting their eggs in a dainty basket, then watering the plants. In other words, she plays along, though I get the distinct sense that she’s just acting out pastoral fantasies. She’s a three-year-old Marie Antoinette playing peasant at her pretend rustic farm. 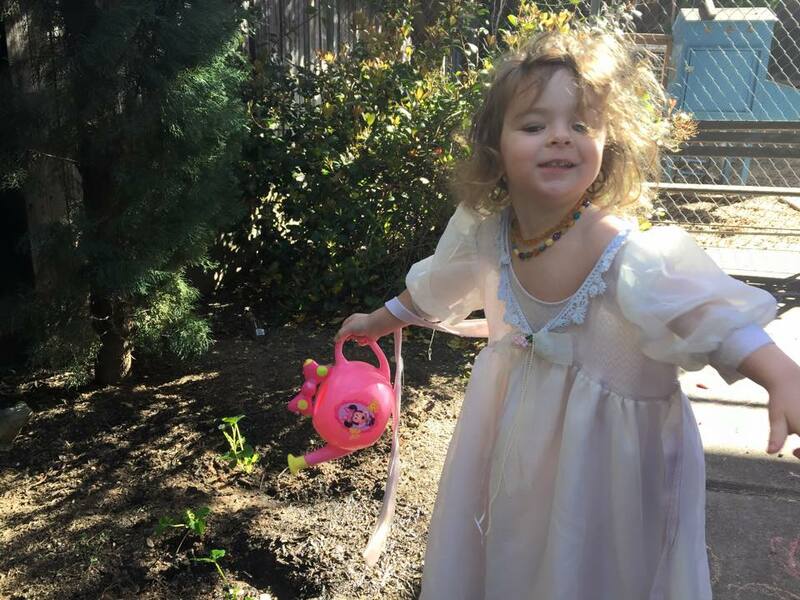 She wears princess clothes and sings as she helps water strawberries with her pink Minnie Mouse watering can. One of these days, I just know a bluebird is going to land on her finger and sing back to her. And I guess I’m cool with it. As long as she aces math and science someday, she can wear whatever fluffy pink contraption she likes.